May we call these steps grave ERRORS? I guess we can. Searching for keywords like “best guest blogging sites”. I could not close my open jaw after learning this but this is true! Assuming a correct grammar and spelling can get their guest post published. Hmmmm…..
Keeping a few generic write ups with them to throw at the site owners no matter what they talk about in their sites. Does Your Guest Blog Campaign Look Like This? These things can kill your guest blogging process even before you start. 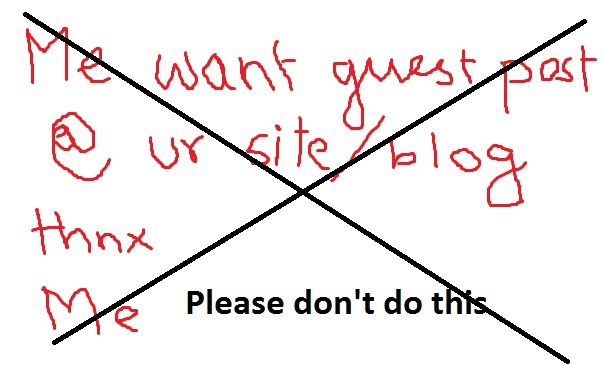 Please DO NOT commit these mistakes if you really want to make it BIG with guest blogging. Frankly, all these mistakes are happening because you are trying to be too smart and do things fast. No, this thing doesn’t work like that. You need to show some patient and finetune your approach. So, how exactly you should proceed? Know Your Area of Expertise: Yes, this is very important. You cant be a master of everything, so know your area of expertise and find out the blogs and websites which are covering those fields. Get Your Name Familiar: Yes, comment on their recent publications, discuss it, share it. Show that you are actively following whatever they are publishing. It makes the site owner happy and also helps them to remember you when you offer to write for them. Write a Personally Tuned Email for the Webmaster: Yes, this is the personal touch which you miss when you use the mass emailer. Little things can make this email become very personal. Try greeting the web master in his native language for example (Google translate!!) or tell him how you have benefited from his works. Everybody has a heart, mate. Point Out What You Can Offer: Again, do not commit the mistake #5 as mentioned above. Write something with sincereity and make sure it is really a worthy post. Add citations, quotes, images, data and make it the best you can. If you are not a native English speaker then get a native or fluent user double check your language of the article. Point Out Mutual Benefits: Why should he post your article? You will be receiving a quality back link to your site, increase your Google author rank but he also would be having a great post at his site without moving a finger. That is his benefit and never fail to point it out subtly. I recently noticed there are a few sites publish nothing of their own and survive on guest posts. These sites are removing the difference between article mass marketing and guest posting/guest blogging. Guest blogging is for class and article posting is for mass. Stay away from these sites if you care a penny about my advice. Why Should You Be Interested In Niche SNSes?